How do you trade cryptocurrency hype for block chain education? 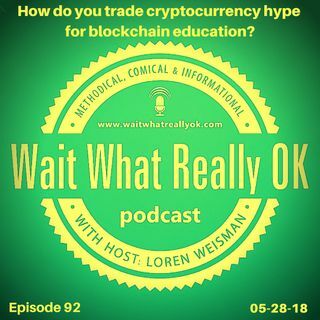 Wait What Really OK Podcast Episode 92 hosted by Branding Strategist talks about Blocking out the lies and learning the facts about blockchain. So much of what is shared on cryptocurrency tends to be half truths, hyped up facts and all out assumptions. Instead of looking at the latest insulting meme about how you didn’t get into buying or trading coins sooner, why not focus on the education, the possibilities and the ... See More options of the blockchain. Blockchain goes worlds deeper than trading coins or making a quick buck. It is not about getting rich overnight and it is not about multi level marketing scams. This borderless ledger system allows for much more than making money. It brings authority, proof, validity and security to contracts, transactions and agreements. This is a global game changer and the fastest track to understanding is educating yourself and going beyond the coin. Episode 92 of the brand strategy podcast Wait What Really OK is called How do you trade cryptocurrency hype for block chain education? The show is available on iHeartRadio.